An important question that many Christians often ask is ” Are we living in the last days or end times?” When people ask me this question, I usually respond with a clear ” Yes and No!” Such an answer requires an explanation. My explanation is that the Bible uses such terminology in multiple ways, so that some references do refer to our own day, while others do not. Sometimes Christians read in the Bible about the ” last days,” ” end times,” etc., and tend to think that all of these phrases all of the time refer to the same thing. This is not the case, just as in our own lives there are many endings: there is the end of the work day, the end of the day according to the clock, the end of the week, the end of the month, and the end of the year. Just because the word ” end” is used does not mean that it always refers to the same time. The word ” end” is restricted and precisely defined when it is modified by ” day,” ” week,” ” year,” etc. So it is in the Bible that ” end times” may refer to the end of the current church age or it may refer to other times. There are a number of different biblical expressions which appear to speak of the end times. The Bible teaches that this present age will end with the rapture, followed by the tribulation, which will end with the second coming of Messiah to the earth. Thus, we must distinguish between the ” last days” of the church age and the ” last days” of Israel’ s tribulation. Many believe that there are specific signs that relate to the end of the church age. However, I believe that it would be too strong to say that there are signs of the end of the church age. Instead, the Bible indicates what the condition of the church will be like- the general course of the age- and then warns about some general trends toward the later part of the church age. Passages like 1 Timothy 4:1- 5, 2 Timothy 3:1- 5, and 2 Peter 3:3 most likely refer to the second half or latter part of the church age. These passages warn believers about beliefs and lifestyles that are common in the world will enter the church and become common there as well. These passages do not speak about the general moral decline of society, which I do not doubt, instead, it is a decline that was predicted to occur within the church as part of the apostasy. It can also be noted, that it is hard to quantify such decline. No matter how bad things get, they can always get a little worse. So it is impossible to know specifically how bad things must be in order for something to be a prophetic sign. It is the general condition within the realm of the church in which ” evil men and impostors will proceed from bad to worse, deceiving and being deceived” (2 Tim. 3:13). There are a number of New Testament passages where ” last days,” ” last times,” and ” last time” clearly refer to the present church age in which we now live. The writer of Hebrews says, ” God, after He spoke long ago to the fathers in the prophets in many portions and in many ways, in these last days has spoken to us in His Son” (Heb. 1:1-2). The contextual nuance of this passage demands that ” last days” is a reference to the current church age in which we presently live. In the same way Peter says, ” For He was foreknown before the foundation of the world, but has appeared in these last times for the sake of you” (1 Pet. 1:20). These ” last times,” to which he speaks, in that context, must refer to the last two thousand years in which we still live. John adds support to the two previous writers when he says, ” Children, it is the last hour; and just as you heard that antichrist is coming, even now many antichrists have arisen; from this we know that it is the last hour” (1 John 2:18). Jude, speaking of things going on in his day says, ” that they were saying to you, ” In the last time there shall be mockers, following after their own ungodly lusts” (Jude 1:18). The Jewish view of Bible prophecy viewed history as consisting of two ages. The first was this present age, the age in which Israel was waiting for the coming of the Messiah. The second was the age to come, the age in which all promises and covenants would be fulfilled and Israel would enter into her promised blessings as a result of Messiah’ s coming. The present age would be terminated by the appearance of Messiah, and the coming age would be introduced by His advent. The present age, then, was to end in judgment, and the coming age must be preceded by this devastation. The New Testament references the present age as the last days. The last days of what? The last days before the coming of the Messianic age. We see that there are at least four clear references in the New Testament that use end times vocabulary to refer to their own day and the entire church age as the last days. Thus, in that sense, we are clearly living in the last days, since the entire church age is considered the last days. 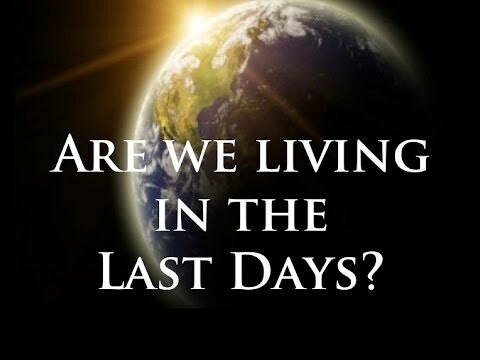 However, that is not what the average person means when they ask, ” Are we living in the last days?” They want to know if we are living in a time when the final prophecies of Scripture are being fulfilled. Before I can answer that, we need to look into the use of Old Testament terminology and the last days. The term ” latter days” is used of the tribulation period twice in Jeremiah (30:24; 48:47). Daniel also uses it this way: ” However, there is a God in heaven who reveals mysteries, and He has made known to King Nebuchadnezzar what will take place in the latter days” (Dan. 2:28). Daniel commences to reveal God’ s plan for the future, which revolves around events that will unfold in the tribulation period. This is also the case concerning another passage in Daniel: ” Now I have come to give you an understanding of what will happen to your people in the latter days, for the vision pertains to the days yet future” (Dan. 10:14). The prophet Daniel uses a whole cluster of other ” latter day” terms that all refer to the tribulation period or prepare the way for the kingdom reign of Messiah. Terms like ” end of time” (Dan. 8:17; Dan 12:4, 12:9) and ” end of the age” (Dan. 12:13) speak of the end-time, tribulation period, which is yet to come. These terms are used three times in Daniel 12, which is said in verse one of that chapter to ” be a time of distress such as never occurred since there was a nation until that time.” ” Distress” is the Hebrew word for tribulation. Thus, the entire context is once again a reference to the coming tribulation. Daniel 12:4, says the teachings about the end-times in Daniel will be sealed up for the Jewish people until ” the end of time.” Many prophecy teachers believe that shortly before Christ’ s return the world would experience an increase in the speed of travel coupled with an explosion of information based upon Daniel 12:4, which says ” many will go back and forth, and knowledge will increase.” No one would quarrel with the fact that the last one hundred years has indeed witnessed an exponential increase in both the speed of travel and the accumulation of knowledge and thus would be a sign in our time that the end is near. But is this really what Daniel is saying in the passage? I don’ t think so. The correct interpretation of the passage is given by Dr. Charles Ryrie in his famous Ryrie Study Bible when he says, ” As the end approaches, people will travel about seeking to discover what the future holds.”  Not just people in general, but the Jewish people in particular. This means that many Jews during the tribulation will study the Book of Daniel in an attempt to find out what is going on during this unique period of time. Harry Bultema says, ” The movement of to and fro may refer to that of the eyes through leaves. . . . Thus considered it seems to us that the text here speaks of the diligent search of the Scripture at the end of time.”  Thus, the scope would be limited to the future time of the tribulation and could not justly be applied to our own day. So are we living in the last days? As you can tell from the above discussion, we are currently living in the last days because we are in the church age, which is called the ” last days,” ” last times,” and ” last time.” However, in no way shape or form are we in the last days, as the Old Testament says of Israel. Those terms, ” latter days,” ” last days,” ” latter years,” ” end of time,” and ” end of the age” all refer a time when Israel is in her time of tribulation. This is a future time, which we could very well be on the verge of entering. I believe that we are seeing the stage being set for last days or end time events of the tribulation. But we are not currently in those times at the present time. Maranatha! EndnotesThe Ryrie Study Bible, NASB (Chicago: Moody Press, 1978), p. 1332. Dr. Ice is Executive Director of The Pre-Trib Research Center. He founded The Center in 1994 with Dr. Tim LaHaye to research, teach, and defend the pretribulational rapture and related Bible prophecy doctrines. Dr. Ice has co-authored over 30 books, written hundreds of articles, and is a frequent conference speaker. He has served as a pastor for 17 years. Dr. Ice has a B.A. from Howard Payne University, a Th.M. from Dallas Theological Seminary, a Ph.D. from Tyndale Theological Seminary, and has done post-doctrial work at the University of Wales in the United Kingdom. Dr. Ice lives in Justin, TX with his wife Janice. They have three grown sons. Posted by IAN D'SOUZA in Are We Living In The Last Days? ← An Easter Greeting 2015 for everyone! “Imminent” is the term I use to describe the prophesied soon coming of our LORD.